I have been knitting for several years now and I can still remember the first time I made a hat. I made it too small that it actually looked like a “mini-royal crown” sitting on top of my big head. 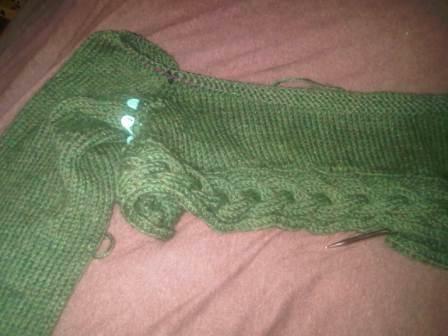 Back in the day I felt that doing a knitting gauge prior to starting a project was just plain silly. I always thought I could tell how many stitches I would need for a hat, socks, scarf, and just about anything. But it never dawned on me then that nothing ever seems to fit when I didn’t do the gauge? As the years have gone on and I have become the gauge-awareness knitter, I feel a joy inside me that my beautiful knitted items can actually fit me and those individuals I make knitted items for. Don’t get me wrong, there have been times that I choice not to do a gauge and it turned out fine and there have been times when I didn’t and I have paid the consequence but overall doing a gauge in knitting is very important. Why would I say this, well, in my last blog post, I was working on a beautiful cropped cabled hoodie from a pattern in Vogue Knitting magazine for my best friend. Vogue Knitting has absolutely amazing knitting patterns and the designers they have are truly talented. I had worked on the sweater on and off for a year (as goes most of my knitting projects) and I felt it was time to finish it up before the yarn disintegrated. The first thing I did before beginning the project was to complete the gauge and after that, I knitted away. I am very pleased to say that I have finished the cabled hoodie however, I had more frustration not from it being too small or too big but realizing another important fact about knitting: not all knitting patterns are accurate. I know some of you may be thinking, “Diane of course this is true and you should know this so why are you mentioning it?” Well, it’s the reality that no matter how long you have knitted and have used a pattern and have received excellent results of your end product, it’s always important to read a knitting pattern before you try and take on a gorgeous yet daunting task to work on a project that may challenge your knitting skills especially from Vogue Knitting. When I saw the pattern in Vogue Knitting, I rushed to WEBS in Northampton and picked out the yarn and never thought twice to look up on Ravelry to see if other individuals had worked on this pattern nor did I check Vogue Knitting magazine to see if there was an errata. Had I done that, I would have realized that more people had challenges and required some tweaking and not only those who were knitting the same pattern but the designer who created the pattern also made changes since it had been published in Vogue Knitting. I do consider myself to be an experienced knitter but I realized that even the most experienced knitter can make mistakes. I encourage anyone who is attempting to work on a pattern that is breathe taking at glance, to check the sources out to see if there are any pattern changes prior to knitting. In doing so, you may find that you will not want to take on the challenge to knit the pattern or you can buckle yourself in tight and knit away. In the end, I am happy that I did tackle my way through the pattern and I completed something absolutely beautiful. 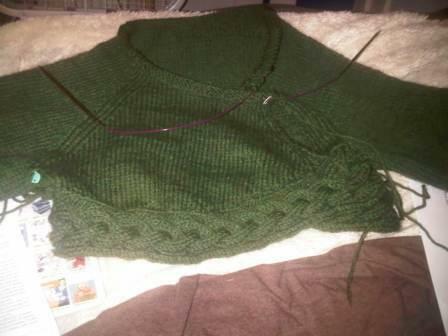 I hope to upload some of the final cropped cabled hoodie in the upcoming weeks.